I’ve written about my feelings toward ribs before. 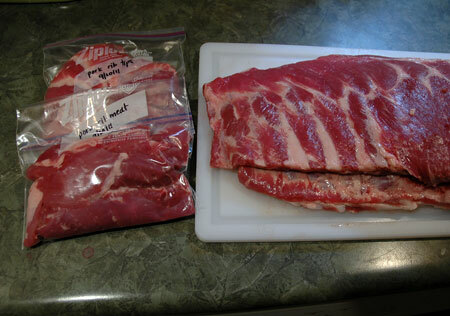 But every so often it is important to tackle a food that I find challenging, both from a technical standpoint and a sensory one, and so it happened that a shrink-wrapped package of pork spareribs came home with us earlier this week. As I started researching potential recipes, it became clear that I was going to have to do some butchery before anything else, in order to turn the rack into a St. Louis-style cut. I followed the photo tutorial here and was pretty satisfied with the results, although I don’t think I did it quite right. But since the package turned out to contain two racks, I got extra practice and extra pork trimmings to use in future meals—I estimate that this $20 purchase will stretch out into 4 meals for three people, which is actually a pretty frugal investment! I used a pretty basic dry rub on my ribs and let it rest in the fridge overnight. The next day I pulled it out to come up to room temperature with a second round of rub, and then cooked it in my stovetop smoker for 2 hours. I suspect that partway through, the ribs were juicy enough to flood the base of the smoker and start creating steam instead, but at least some smoke flavor was able to penetrate. 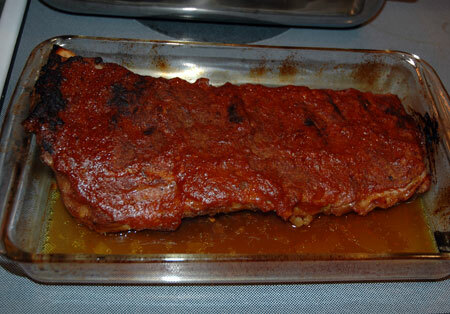 After that, I transferred them to a 225F oven with a little apple cider and cooked them slowly for another two hours or so, removing the foil cover in the last 30 minutes and basting with some homemade barbecue sauce, and then broiling for a little char right at the end. The ribs were definitely well-cooked—when I went to transfer this portion to my plate, the rib bone on the end slid right out! They were tender and juicy, with a surprising amount of meat on them, according to my mom (who is probably more used to eating babybacks). 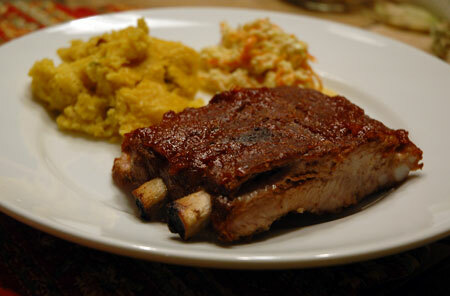 With my aversion to the mess that ribs can make of your face and your fingers, I ate very carefully but was pleased with the level of smoky flavor I was able to achieve. Per my dad’s request, I served this meal with not only a side of coleslaw, but also a corn pudding (or corn casserole or spoon bread). My mom usually makes it with creamed corn, sour cream and muffin mix, none of which we had on hand, so I tried out a different recipe with pretty successful results, stirring in some sauteed onion and green pepper (a slightly spicy Mexican improved pepper from our garden, not bell). It came out very creamy and moist, with a little kick and a little sweetness, but still felt so much less fatty than the versions I’ve seen before. This recipe is a scaled-down version of the original for our small family, and we still only ate half of it with our dinner; the full-sized recipe fits in a 9×13 baking dish. I used a combination of flour and masa here, but next time I will try it with masa only. I also drained and weighed my canned corn; two 15-oz cans equaled precisely one pound. Finally, I thought it came out a little too sweet, even using canned corn, and have duly decreased the sugar here; you might want to use even less if you are making it with sweet corn cut from the cob. Preheat oven to 350F. Lightly grease a 1.5-quart baking dish and set aside. In a small skillet, saute the onion and pepper in a little butter or olive oil until tender; set aside to cool slightly. (You could also use a roasted pepper, peeled, seeded, and chopped.) Meanwhile, in a food processor, puree the corn with just enough milk to make a smooth puree, not exceeding 1/2 cup. With the machine running, add egg yolks one at a time, and process 30 seconds after each addition; then add sugar a little at a time, and continue processing until mixture is lighter in color and sugar is dissolved, about 3 minutes. Add butter and process until smooth. Transfer to a large bowl; fold flour, salt, baking powder, and pepper mixture into corn batter. In a separate bowl, beat egg whites until soft peaks form and fold into corn mixture, alternating with the shredded cheese. Pour into the prepared baking dish, and bake in preheated oven for 45 minutes, or until golden brown. This can be served warm or at room temperature, but ideally bake as close to serving as possible, since the soufflélike consistency will fall as it cools. 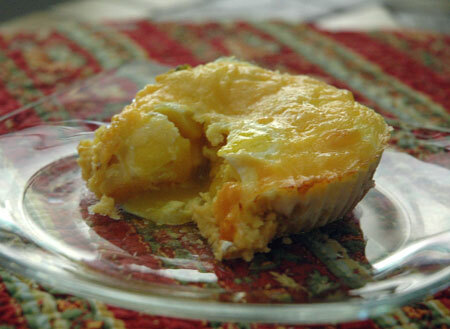 The corn pudding can also be made in individual serving sizes simply by baking in small ramekins and adjusting the cooking time.